Kong's easy to throw, far flying, fun fetch toy with the handy throw rope. 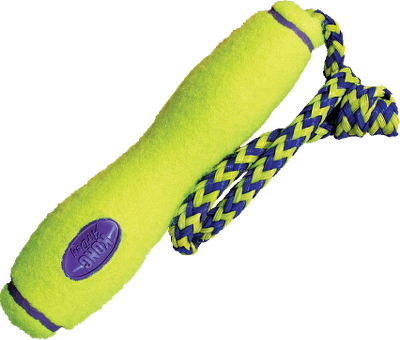 The tennis fetch stick is securely attached to a nylon rope that lets you get the maximum distance from every toss. Air Kong toys are just what they look like--100% pure tennis ball made in the same factory, using the same materials, as any high-quality tennis ball. Totally non-toxic and won't wear down teeth. This toy floats as well, making it great for dogs who love the water!